Find assistance easily for small tasks. 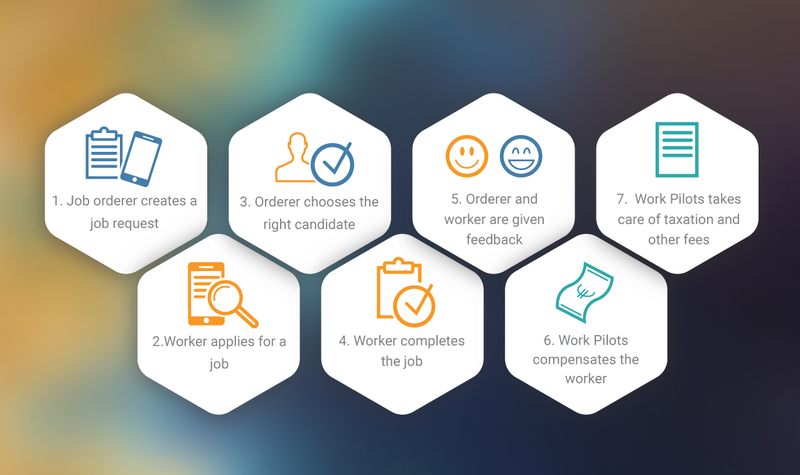 Work Pilots finds the right workers and help for short-term jobs, even on a short notice. Every office has some work that has been left undone: cleaning up the storage, organizing files, moving old furniture – you name it. With the help of Work Pilots, you’ll find help for your business or organization quickly and easily. We bring enthusiastic workers to you from close by, in a uniquely easy way, without the paperwork needed for an employment contract. Whether you’re looking for a helping hand during high seasons, or want to offer a chance for the youth, Work Pilots is for you. You can also use Work Pilots if you’re looking for a long-term employee. By giving little jobs to a few people, you will easily see who works well and fits into your work community best. This way you can minimize the risks of a failed recruitment. You can often find workers for the job openings within minutes. By obtaining a worker through Work Pilots you will not only make yours and your colleagues’ lives easier but also give someone the chance to make some money and get invaluable work experience. You can also create a group of trusted workers, use a billing option or to give hours as a gift for your clients or staff. If you are interested, contact us! The price for our service is 16€/hour (12,90€ + VAT 24%). The worker’s share is 10€/hour (personal tax withholding deducted). If you order workers for your business, you can use the company bank card (if you have one) or check if you can place the order with your personal bank card and get a reimbursement of expenses. You can download the WorkPilots app from the application store on your phone for free. You can also use the service on your computer here. Also, go check out our 10duunit campaign, several businesses and organizations are already involved! Go ahead and start using Work Pilots today! WHAT KIND OF TASKS COULD BE RELEVANT? You have the office fair coming up, does someone have time to gather and organize the folders? Or take care of all the copying and printing that needs to be done. What about cleaning out the storage from all of the old material and junk? Solution: Report the task in Work Pilots, select the appropriate worker and your task is done. You don’t want to waste the time of your own professionals with moving furniture and equipment, when there is a low-cost solution. Order a worker from Work Pilots and let the professionals focus on what they are good at. Mowing the lawn, trimming bushes, collecting garbage and other small yard work can be easily taken care of when you order the service from Work Pilots. The recruitment process can sometimes be tedious. Why not order a few tasks from Work Pilots and see how the workers adapt to your office environment? You will easily see how the workers attitude, personality and approach to work fits with your company’s needs. We wanted to create an application that would make offering and finding work opportunities extremely simple. The app is always with you on your mobile phone and it will find the perfect worker for you nearby. Don’t worry about the contracts or payments: we will take care of them for you. You will only commit to one job at the time. With its simple but efficient user interface, offering a job will always be in your control and you will only pay for a job done. With feedback from both sides you can also see how workers have been rated for previous jobs. The app was developed in Finland in collaboration with many public operators and companies. Because of it’s strong security and risk management analytics, the service is completely safe.